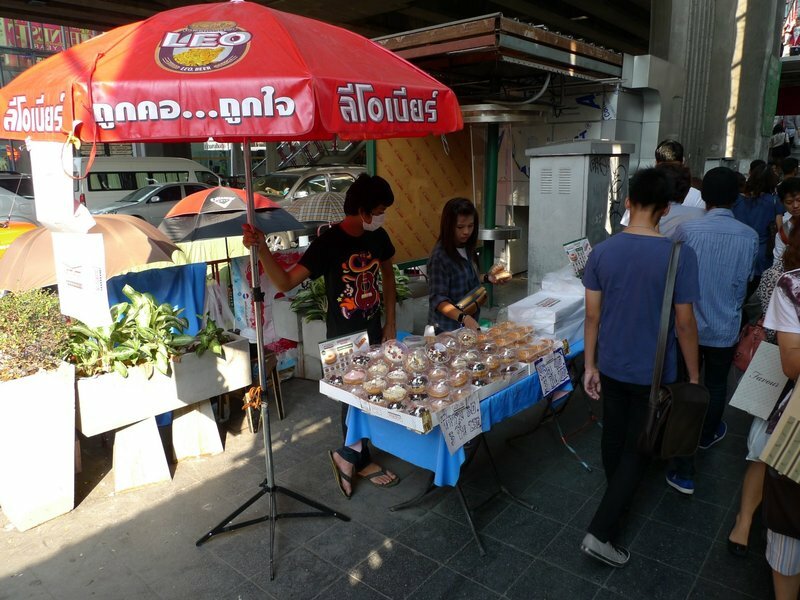 This entry was posted in Uncategorized and tagged Bangkok, Black, Black Market, Demand, Donut, Economics, Krispy Kreme, Market, Paragon, Siam, Supply by christao408. Bookmark the permalink. The only way I would eat Krispy Kreme is if it was coming fresh out of the oven… Without the “just-made” part, it seemed useless! With that in mind, I don’t get the craze – they’re missing out! Just made Krispy Kreme or nothing at all. bleh. A donut black market? Out of all the products in the world, it’s very interesting to me that there would be such a market for donuts! hahaha krispy kreme scalpers? that’s hilarious! i don’t even like krispy kreme doughnuts though; i think they’re way too sweet. I’m not much of a donut fan. They’re always either too sweet or too dry for me. I don’t care for donuts, period! Krispy Cream or otherwise. I can understand the fad among the Asians though. Same thing happens when a new chain opens in India… and even here in the US. Scalpers? Now that is funny!I like this profile picture of yours Chris. I remembered the lines at Krispy Kreme in USA way back. There is no line now, so it is indeed a fad. Krispy Kreme is slightly different from other donuts that it seems to stay fresh longer. BTW, I had my first donut yesterday and that is my quota for the year. hehe. Would I buy one from the scalper? no way. I think that is a riot – funny – We sell Krispy Kreme donuts but I think that are too sweet. But they do sell – convenience store -where I open, people buy two donuts and coffee every morning. Talk about a sugar fix!!! Black market donuts?! That’s just plain crazy!!! I would never have guessed! Krispy Kreme donuts are alright I guess, but not to that extent. Such a hilarious article, Chris. I have been always amazed at all those skinny Thai boys & girls shopping at Siam Paragon, eating big dishes of ‘kao mun gai’, slurping ice cream at Haagen Daz and now…..Crispy Creme dognuts? How do they keep so skinny after all?By the way, I don’t think the street vendor is a good idea, that sugar coating on the donuts will melt under the Bangkok sun/heat for sure! To answer your question the reason for all this donut craziness is…its an American novelty and maybe even, its popular to be there and be seen ? Overtime as you say, the donut will loose its appeal and people will go back to eating whatever else makes them happy. Though , I will say that I’ve heard that some actually think that eating a donut gives them good luck. Especially single women. The donut reminds them of a wedding band and by eating it.. it creates hopes of marriage. Now, remember my brother I am a bit of a crazy guy so never take my answers too seriously. Though you got to admit, my answer seems somewhat logical ??? @Passionflwr86 – @ALovingAdversary – I’m with you on that. Fresh made or nothing…@CurryPuffy – Honestly, I’m noticing that in general, there are more and more Bangkok residents who aren’t the skinny Thais that they used to be. No doubt that the Krispy Kremes, et al of the world are part of the cause. @TheCheshireGrins – Isn’t it curious? @Sinful_Sundae – Andy and I were discussing the egg tart trends in late 90s in Hong Kong and Taipei. You’ll be interested to know that KFC has just introduced Portuguese style egg tarts here in Bangkok. @jace1982 – There’s a picture in my blog from two Aprils ago of the line outside the Kirspy Kreme in Shinjuku, by the railways station. Ah, my! @ZSA_MD – Thank you. I borrowed it from the other website some of my entries post at. I think the background is too dark for this site. The old picture had a lighter background. 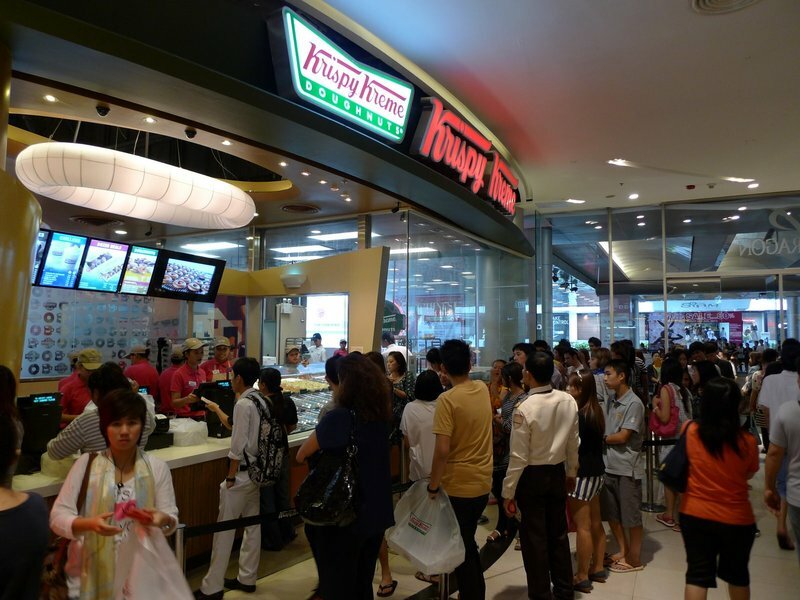 @yang1815 – @Roadlesstaken – @Dezinerdreams – To which the Thais in line would probably respond that we’re crazy for not wanting Krispy Kremes with such passion! LOL@murisopsis – My family would sometimes go to Estes Park, CO in the summers. I remember a donut shop there that made these wonderful apple fritters with fresh apples. Yum. @Fatcat723 – @kunhuo42 – @twentyse7enn – They are overwhelmingly sweet, aren’t they? @stevew918 – Yes, I remember when the first one opened in the Bay Area, we had lines like crazy, too. @bengozen – Honestly, with the amount of sugar in the Thai diet I’m surprised that diabetes isn’t more common. 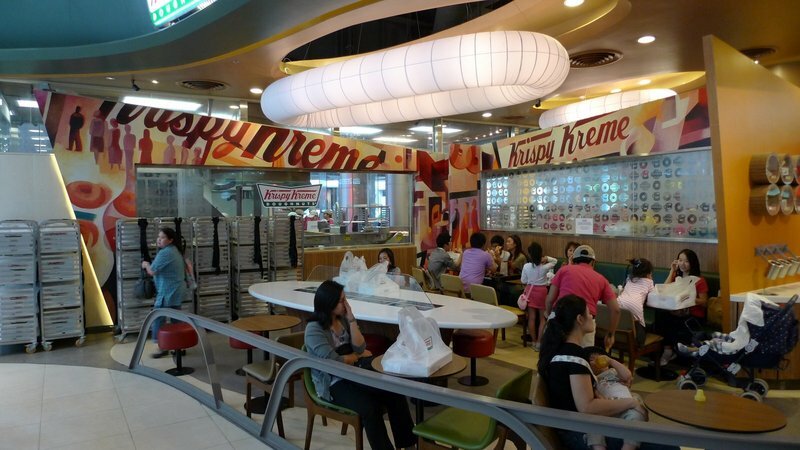 @christao408 – i remember the big craze that ensued when krispy kreme first came to hawaii (before then, it was a novelty that people had to bring back or have shipped in). i heard the lines were insane! i never thought it was worth it for a doughnut. @kunhuo42 – They opened in HKG (subsequently have closed) and had an outlet in the airport terminal near check in. 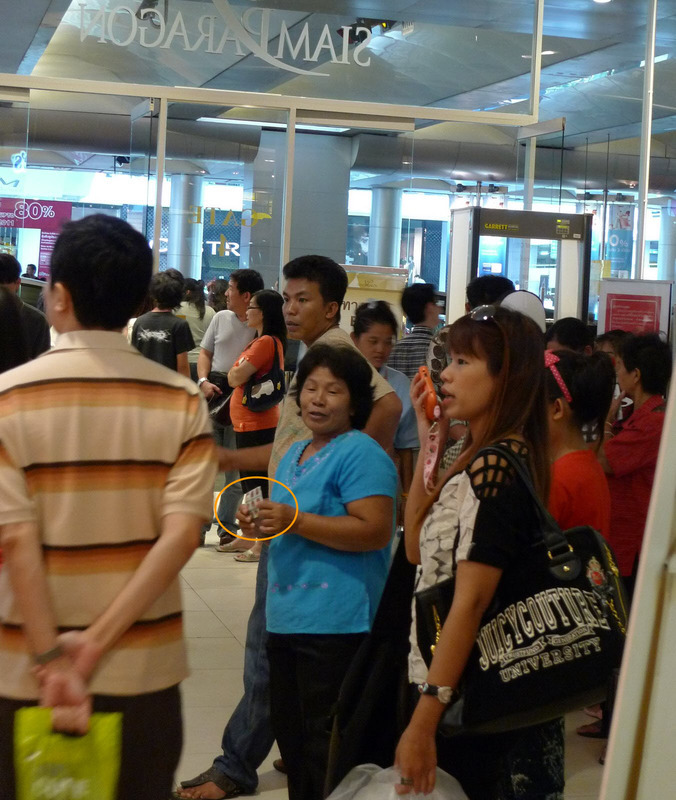 We would see people carrying dozens of donuts onto flights back to Bangkok. scalping tickets for donuts? Hmm… that is very enterprising. I’m not big on doughnuts though but there are days when I succumb to their seductive call.btw – that’s a nice headshot. @ElusiveWords – @rudyhou – You mean the head shot of me? Oh, thank you. It was taken by the photographer for catandnat.com, where some of my posts are also appearing as a guest contributor.Rudy, as for the shops selling similar products, we’ll probably see a lot of that here, too, but with donuts we already have a half-dozen different shops so the market is quite full already. Dunkin’ Donuts made a defense move by introducing (emphasizing?) its line of “American Style Donuts” which I guess are meant to counter Krispy Kreme. @Bangkok Blogger – Oh, I’ve never seen your site before. Very interesting. Looks like great minds think alike! I’ll have to read more of the posts on your site. Thanks for stopping by and commenting.